This elegant and oversized Tam-O-Shanter shaped glass lamp shade features a decorative crimped top, and timeless opal white glass color. 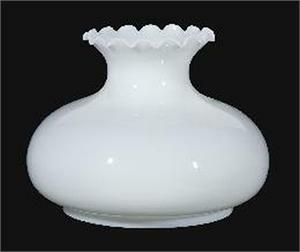 The 10" base diameter (fitter) works with Aladdin Kerosene Mantle Lamps brand of table lamps, as well as many antique central draft table lamps and hanging lamps. If you are looking for a replacement lamp shade for the Aladdin Majestic series lamps (D2301, D2302, or D2303), this is the closest shade currently offered. It can be painted or decorated as well. The #06108 Big Bulge Shade has a 10" fitter, 13 1/2" bulge (widest point of shade), and is 10 1/8" tall. Hand blown, quality glass. American Made.